We are super-excited to announce that we are now a Platinum Partner for Desktop on Demand, allowing us to provide our customers with Hosted Desktop solutions and all the benefits of moving to a cloud-based solution. SO WHAT IS DESKTOP ON DEMAND? Desktop on Demand (AKA: DOD) is very similar to your normal desktop, but instead of all of your data and applications being stored on your physical PC or laptop, everything is moved on to secure UK data centres (also commonly referred to as the cloud). No more worrying about backups, or data loss, or costly hardware upgrades; Desktop on Demand takes care of everything. They have a specialist cloud team who provide hosted desktop solutions in the UK to a wide range of professional sectors, including: Accountants, Solicitors, Recruitment Agencies and Charities. Your business can operate as you would with a normal IT infrastructure, but at a fraction of the price…..and of course, with all the added benefits of cloud computing. We’ve perfected our service to make it an unbelievably simple choice for our customers. Both of our hosted desktop packages are fully scalable and packed full of feature goodness…and of course, we have a bundle of package add-ons available to tailor the solution to your business. WHAT ARE THE KEY BENEFITS OF A HOSTED DESKTOP ? Hosted virtual desktops are just like your normal office PC/Laptop. All of your data and applications are moved into the cloud (on hugely powerful UK servers) and you’ll access these through the same desktop interface you are so use to. Your desktop is hosted and managed in the cloud, which allows you to access your desktop from anywhere, any time and on any device. Consolidate your IT costs by removing the need for expensive servers and existing costs associated with IT, such as: Hardware, Support, Anti-Virus, Back-ups, Licensing and Software Updates. Moving your business to a hosted desktop solution will reduce the need for servers and hardware. Our multiple UK data centres operate a fail-safe backup system. So in the unlikely event of a data centre failure, you can be sure that your data is safeguarded and there is minimal interruption to your business. 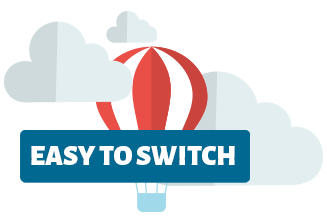 Desktop on Demand has a dedicated switching team making it a smooth ride up in to the clouds for your business. Find out more on their website, it’s packed full of useful information that will help you understand the benefits of switching your business to a Hosted Desktop solution from Desktop on Demand.